Sand-making machine is professional equipment for sand and gravel production, with the rapid economic development, the demand for sand and gravel rises year by year, but natural sand market shows up practical problems as lack of supply, prices rise, higher transportation costs due to the limited number of natural congenital conditions such as purity, particle size, damage to environment. The traditional sand-making machine is facing many problems such as polygonal rough, uneven grading, impurity, inadequate performance, etc., which cannot satisfy the demand when facing the wide market. Guilin Hong Cheng keep a foothold on the sand-making market, aimed at the forefront of sand production technology, to introduce advanced technology both domestic and overseas for the purpose of improve energy efficiency, reduce wearing rate, prolong maintenance cycle, reduce maintenance time-consuming, increase crushing efficiency and control level. Guilin Hong Cheng Heavily launched the new series of sand-making machine, to solve the sand production problem which plagued the whole industry with a new solution of drying sand-making program. Guilin Hong Cheng sand-making machine adopted current advanced technology, maximum close to nature sand procedure of natural breaking, erosion friction, natural washing etc., and to integrate granulocyte-type optimization, gradation adjustment, moisture control, environmental protection into one, produced qualified sand with gradation reasonable, rounded grain type, powder containing controllable which can totally meet market demand. Ore raw materials fall in the high-speed rotation impeller through top of the machine. Materials are thrown out under the action of centrifugal force, collision and broken with peripheral shield. Then diverted by bulk material plate, some scattered from the surrounding, others enter the rotor and accelerate out of it, collision and friction with material scattered around, at the same time impact, friction, crushing, rebounding with the peripheral shield to form a circular blow. 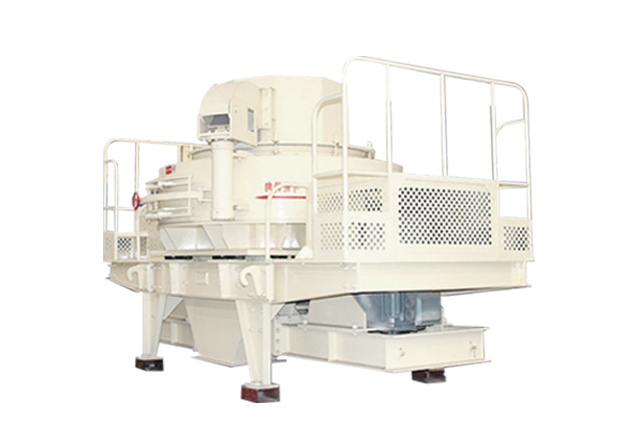 Sand discharges from the discharge port at lower part of the machine, then achieve the desired size through screening equipment. * The table output changes according to the system parameters and materials properties. * Raw material moisture content of 3% or less. * For specific conditions of system configuration and production information, please contact 400-677-6963. 3, Excellent Grain Shape: finished sand is superior in grading, grain type, the amount of powder containing other process indicators, stable performance, and adjustable ability, comparable to quality natural sand, especially suitable for artificial sand-making and stone shaping. 4, Easy Installation and Operation: the device is light, easy to install, operate, repair, and maintenance. 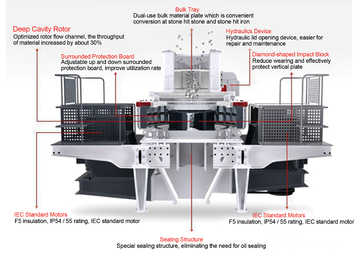 5, Multiple functions, convenient and flexible: The advanced feed crusher structure made of advanced and durable material, with a variety of crushing chamber, can effective solve the problem of a machine of multiple use, especially for artificial sand, gravel shaping, abrasive materials and other production lines, to meet different customer application needs.